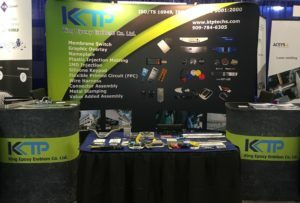 KTP King Epoxy Emblem exhibited at the Del Mar Electronics Show in San Diego, CA on May 3 and May 4, 2017. Thank you for stopping by our booth! KTP King Epoxy Emblem is your leading provider of user interface solutions and decorative solutions for your electromechanical requirements. Products featured during the show included membrane switches, capacitive touch switches, FPC, silicone rubber keypad, graphic overlays, decorative nameplates, and complex plastic injection molding with insert molded label (IML). Our extensive experience in this industry makes us your ideal choice for a supplier-partner. Please contact us for a quote and/or design questions. We can be reached at 909-784-6302 or by email at sales@ktptechs.com.